When your podiatrist thinks it’s time to start using orthotics, finding the right fit is of paramount importance. You may think that getting fitted for custom foot orthotics is a complicated process requiring time, money and expensive equipment. However, getting the support your feet need is actually easier than you think! When you order thermoplastic orthotic insoles, achieving a glove-like fit during an in-office visit is easy and can be done in as little as 10 minutes. Best of all, Atlas Biomechanics crafts orthotic inserts for each type of wear. 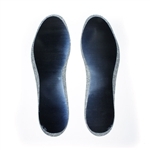 Our heat molded insoles are available for dress shoes and athletic footwear, as well as in prefabricated models. Shop our selection of ortho inserts for podiatrist use and save on shipping when your order reaches $50! Atlas Biomechanics' thermoplastic heat moldable custom orthotic blanks allow you to produce a lab quality orthotic in office in about 10 minutes for a fraction of the price. Atlas Biomechanics offers dress and athletic orthotic blanks and prefab orthotic. 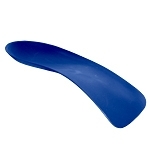 Please view our Orthotic Fabrication Guide to learn how easy it is to make a custom orthotic. Our orthotics ( arch supports ) will control subtalar joint pronation that causes valgus heel, collapsed arch and plantar fasciitis. * fraction the cost of orthotic labs. 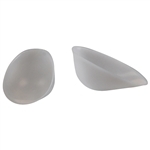 * 3/4 semi rigid shell, long lasting, total contact fit custom orthotic. * 1.3 mm thin proprietary material for ease of molding. * two orthotic models, Athletic (medium profile) and Dress (narrow profile). plantar fasciitis, heel spurs, fallen arches, foot pain, posterior tibial tendonitis, weak feet, tired feet, foot pain, mid tarsal pain, ankle instability, knee pain, and lower back pain. Rather than go by the shoe size, it is better to hold the orthotic blank directly to the foot. Fit the orthotic just proximal to the metatarsal heads and just a little (1-2mm) behind of the heel. After deciding which blank to use, hold it directly to the foot. Do not fit the blank while the patient is standing on the blank. Dorsiflex the hallux (big toe) to see if the metatarsal head clears the end of the orthotic. 1) Purchase a heat gun (not a hairdryer) and heat resistant gloves at any hardware store. Place the blank on a surface that will not burn from heat. Hold the heat gun 1cm (1/2 inch) away from the blank. Slowly move the heat gun up and down the blank. Do not stop moving the heat gun ( you will melt the orthotic). The average time is about 1.5-2 minutes. Wearing heat resistant gloves you may push the arch to check for softness. If it is still stiff, reheat for 10-15 seconds. 2) Boil water and turn off heat. Wait 1 minute and then place the orthotic blank in the hot water. Let the orthotic blank sit in the water for 1 minute. Using heat-resistant gloves place the orthotic under the shoe's insole. 3) Atlas Biomechanics also recommends using a toaster oven at 200 degrees. You can mold the blank either as Subtalar Neutral or Calcaneal Resting Position, or a combo of each. Do not mold directly to the foot. Use a heat protector such as a towel, double socks or the shoe's insole. Make sure the rear of the orthotic is not too far forward on the foot. Make sure the medial side of the orthotic covers the arch entirely. Either hold the foot in Subtalar Joint Neutral or Calcaneal Resting Position and have the patient press firmly down. If molding directly in a gym shoe, use the insole as the heat protector. Place the orthotic under the insole and have the patient press down. After the patient has molded the orthotic, place it in their shoes. 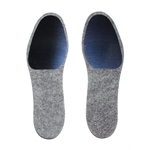 It is most comfortable under the insole. As with any new device in their shoe, there is a break in period. If using the orthotic in gym shoes, place it under the insole. If wearing it in dress shoes, use a little double-sided tape to hold in place. Have the patient wear the orthotic only 2 hours the first day. Every additional day increases the time by 2 hours. It uncomfortable, have them remove the orthotic, wait 2 hours and resume the break-in period. Atlas Biomechanics recommends the patient return in two weeks for a follow-up and fine tuning of the orthotic. To avoid any problems, you want the patient to be happy with the fit before they leave the office. Make sure the orthotic is feeling fine to the patient and fits well. Remember this orthotic can be modified endless ways with the heat gun. Sometimes the patient will feel that the arch is either too high or low, modify it to their comfort level. You may see waves in the orthotic. This is the bony prominences of the foot that have been captured in the orthotic and is an accurate mold that should be comfortable on the foot.